LONG BEACH, Calif. – April 1, 2014 – High school football in Texas is a big deal. “Even our photographers feel the competitive vibe when they set up team shots on the football field,” said Pete Wagner, vice president of Visual Services of Texas-Houston, LP (VST), a school sports and event photography company serving over 170 schools in the greater Houston area. As a high-volume photography company, VST discovered 15 years ago in-house printing is more convenient and cost-effective than outsourcing. And after years of “putting a lot of miles” on a costly in-house chemical-based minilab, the company stood at a technology crossroads. “We had to decide the cut-off point for investing in older technology that was proving too costly to maintain,” said Wagner. He knew which way to turn when he saw the SureLab D3000 in action at his local Epson representative’s studio. “We were content with the quality from our in-house wet minilab, but I was surprised to find the Epson dry lab had quality twice as good, and it was reasonably priced,” said Wagner. By the next school term, VST had installed two SureLab D3000 dry labs that were printing a high volume of sports photos for 170 high schools and junior high schools – preserving memories of school spirit, students, coaches and teams, whether football, basketball, baseball, soccer, volleyball, track, swimming, tennis, bands, orchestras, choirs, cheerleaders, proms, or homecoming dances. After a photographer finishes shooting the school event, images are delivered to the in-house studio via camera cards or file sharing. The VST production staff gets busy loading images into a database to sort for each individual school, sport, team, and player. Next, images are edited and retouched using Adobe® Photoshop® and ACDSee™ Pro 7 software. VST also shoots and edits with ExpressDigital® Darkroom™ Assembly school group photography management software and field station laptops. Staff use PrintShop® Deluxe to print order envelope labels on a standard desktop printer, with stations for shipping boxed product back to the schools. During VST’s busy season, the SureLab D3000 dry labs produce up to 500 prints per day, including 8”x10” pages (combinations of 2.5”x3.5”, 5”x7” and 4”x5” sizes) and specialty work like 12”x48” team picture panoramas. One SureLab D3000 is dedicated to outputting individual photo packages, while the other prints à la carte products and high-volume 8”x10” team photos. 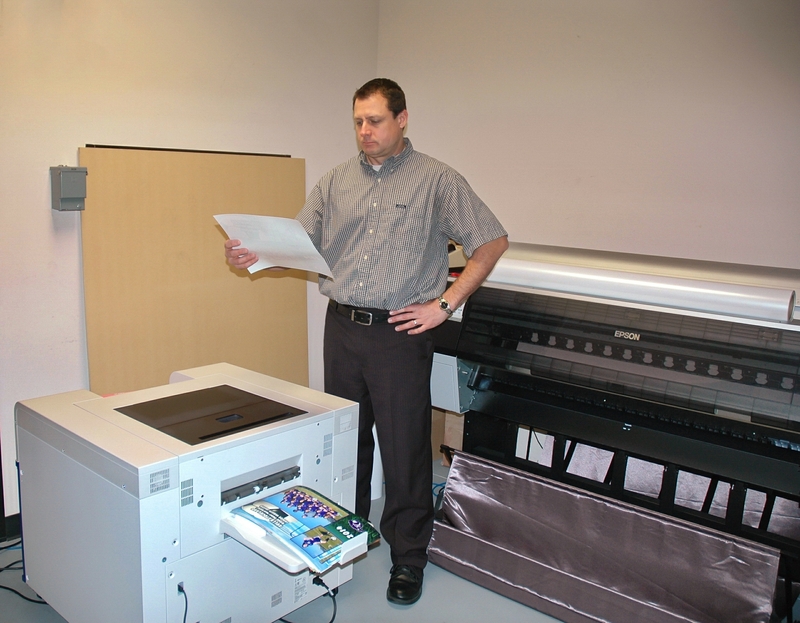 VST also uses an Epson Stylus® Pro 7900 for large-format printing up to 44-inches wide. With the SureLab D3000, VST can produce up to 260 8”x10” prints per hour and up to 650 4”x6” prints per hour1 without lab fees or delays. The printer uses Epson’s MicroPiezo® print head technology with variable droplet sizes as small as 1.5 picoliters. For use exclusively with six-color Epson UltraChrome® D6 ink cartridges and not with any other inks or cartridges2, the SureLab produces water-resistant prints with image quality beyond traditional chemical-based photo labs that will last for generations3. The dry lab is available in a single- or dual-roll configuration, and either unit can be coupled with an optional 10-bin sorter. “Our biggest money savings with the SureLab came from no longer having to store and properly dispose of hazardous waste,” said Wagner. Outside Houston city limits, VST must conform to the limitations and regulations of its off-grid municipal sewage status. Using the SureLab D3000 instead of chemical-based systems, VST can erase costly overhead from its balance sheet – up to $7,000 per year for silver halide effluent storage. 1 Print speeds are based on print engine speed only. Total throughput times depend upon front-end software, file size, printer resolution, networking, number of pages per print job and frequency of jobs. 2 The SureLab D3000 is designed to use only Epson ink cartridges and not other brands of new or refilled cartridges, or other brands of ink or bulk ink systems. Using Epson cartridges is important for reliable performance and high image quality. Epson offers voluntary recycling of spent ink cartridges. Note: EPSON, Epson UltraChrome, MicroPiezo, SureLab, and Epson Stylus are registered trademarks and EPSON Exceed Your Vision is a registered logomark of Seiko Epson Corporation. All other product brand names are trademarks and/or registered trademarks of their respective companies. Epson disclaims any and all rights in these marks.